Weak reactivity with Chicken, Fruitfly (Drosophila melanogaster) and Xenopus laevis. conjugated to KLH, corresponding to C terminal amino acids 575-592 of Dog Calnexin. This sequence is identical to mouse, human and rat calnexin over these residues. 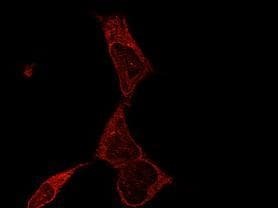 Heat Shocked HeLa Cell Lysate. Our Abpromise guarantee covers the use of ab13504 in the following tested applications. IHC-FoFr: Use at an assay dependent dilution (PMID 18621691). WB: 1/2000. Detects a band of approximately 90 kDa (predicted molecular weight: 90 kDa). Calcium-binding protein that interacts with newly synthesized glycoproteins in the endoplasmic reticulum. It may act in assisting protein assembly and/or in the retention within the ER of unassembled protein subunits. 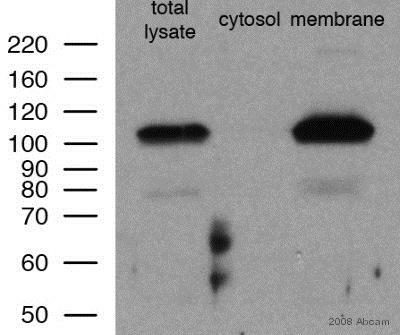 It seems to play a major role in the quality control apparatus of the ER by the retention of incorrectly folded proteins. Endoplasmic reticulum membrane. Melanosome. Identified by mass spectrometry in melanosome fractions from stage I to stage IV. 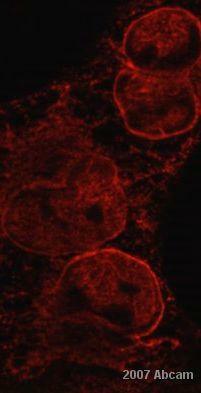 Immunocytochemistry/Immunofluorescence analysis using ab13504 at 1/80 for 12 hours at 4°C in Heat Shocked HeLa Cells. Fixed 2% Formaldehyde for 20 min at RT. Secondary Antibody: R-PE Goat Anti-Rabbit (yellow) at 1/200 for 2 hours at RT. Counterstain: DAPI (blue) nuclear stain at 1/40000 for 2 hours at RT. 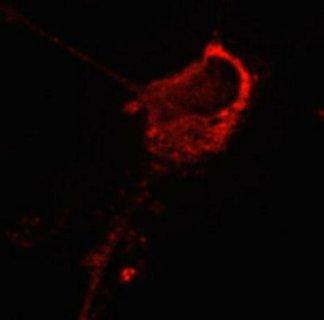 (A) DAPI (blue) nuclear stain. (B) Anti-Calnexin-CT Antibody. (C) Composite. Heat Shocked at 42°C for 1h. Immunohistochemistry analysis using ab13504 at 1/100 for 1 hour at RT in mouse backskin. Fixed by Bouin’s Fixative Solution. Secondary Antibody: FITC Goat Anti-Rabbit (green) at 1/50 for 1 hour at RT. Immunocytochemistry/Immunofluorescence analysis using ab13504 at 1/80 for 12 hours at 4°C in Heat Shocked HeLa Cells. Fixed by 2% Formaldehyde for 20 min at RT. Secondary Antibody: FITC Goat Anti-Rabbit (green) at 1/200 for 2 hours at RT. Counterstain: DAPI (blue) nuclear stain at 1:40000 for 2 hours at RT. Heat Shocked at 42°C for 1h. Publishing research using ab13504? Please let us know so that we can cite the reference in this datasheet.